Autumn Leaves In Summer: cookie cutter craze! last week i was browsing some unique cookie cutter designs, and decided i wanted to bake some cookies but the kitchen ran out of flour and i want new cookie cutter shapes. last tuesday, i took the chance to buy a packet of cookie flour at Daiso when minori and i were out for a lunch date. 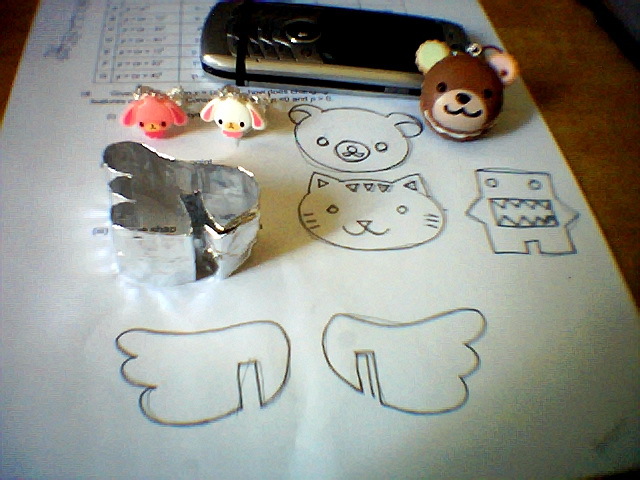 in the meantime, i fell hopelessly for the macaron gashapon, so i bought one as a phone accessory. my new macaron handphone strap was randomly spat out from the gashapon machine, and i received the main character on my first and only try. i also bought two cabochon of (pirated) Sugarbunnies and DIY them into rings. it seems i still have one last plain undecorated ring - what should i stick on it? here is an upclose photo as a proof of my cookie cutter craze! 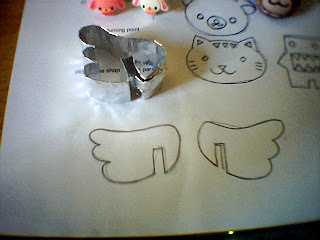 i read a short and simple tutorial on how to make your own cookie cutter, and all you need is a sheet of aluminium foil! 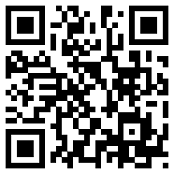 first, i folded it on the wider edge for maximum length. second, i pressed it into the shape i want (in this case, wings). then i squished the two open ends together to create a "closure." 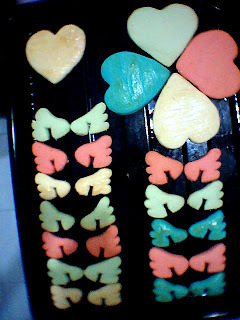 yesterday, i mixed the Daiso cookie flour with some cake flour (bought over the weekend) and a few colouring and flavours. 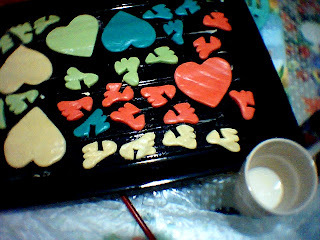 the colours seem rather toxic (like plasticine) but rest assured, they baked well and turned into delicious soft cookies!